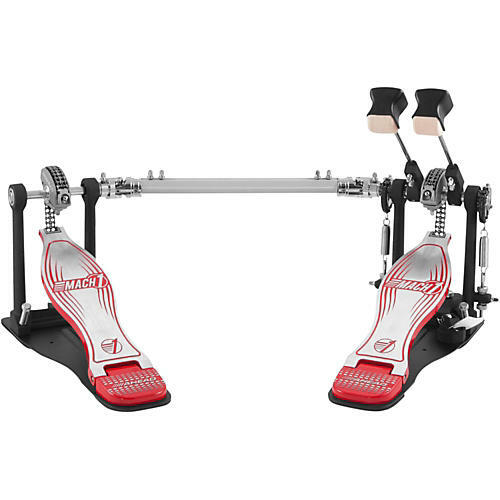 The Mach 1 Pro Double Pedal was designed for long-lasting durability and enhanced by the Quick Torque Cam for additional speed and performance, all provided at a great value. This pedal features Eccentric Quick Torque Cams that were engineered to enhance speed, return action and performance. A dual-chain drive cam provides smooth action with no loss of power, while maintenance-free sleeve bearings in the heel hinge of the footboard ensure long-term durability and smooth action. The dual-sided beaters offer both felt and plastic textures. The solid engineered base features a drum key mounted on the baseplate. AHEAD drumsticks are not unbreakable. AHEAD drumsticks have a much longer life span than traditional wood drumsticks. 1. Warranty is not applicable to tips, covers or grip tape which are replaceable. 2. Warranty does not apply to sticks damaged by use of worn-out covers or dents in the handle. The user must replace covers when they show through-cuts. Chips or dents in core shaft will reduce the stick life up to 75%. 3. Warranty is not applicable to misuse and does not apply if any alterations have been made. For AHEAD drumsticks purchased outside of the USA and Canada, please refer to your local distributor. Do not send extra covers or original packaging (send both sticks only.) Allow up to 2-4 weeks for shipping and handling. 5. Because AHEAD cannot control usage of this product. AHEAD's sole responsibility will be replacement of defective merchandise. AHEAD will not be responsible for damage to person or equipment due to the use of this product.